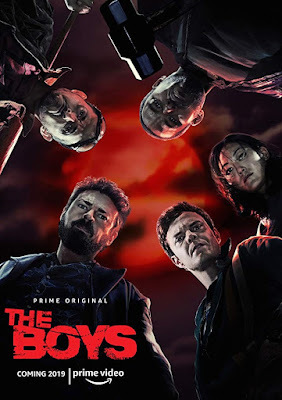 AMAZON CHACE CRAWFORD KARL URBAN THE BOYS 1ST TEASER AND POSTER FOR AMAZON'S THE BOYS ANTI SUPERHERO SERIES WITH KARL URBAN AND CHACE CRAWFORD! 1ST TEASER AND POSTER FOR AMAZON'S THE BOYS ANTI SUPERHERO SERIES WITH KARL URBAN AND CHACE CRAWFORD! superheroes embrace the darker side of their massive celebrity and fame. 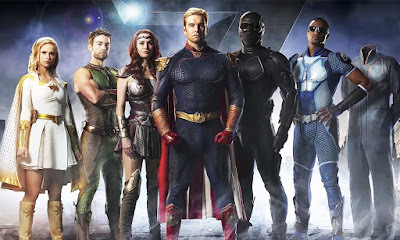 It follows a group of vigilantes known informally as THE BOYS who set out to take down corrupt superheroes with no more than blue collar grit and a willingness to fight dirty. The Boys will try to bring down the superhero pests! Crawford as aquatic hero The Deep, Antony Starr as Homelander, Nathan Mitchell as Black Noir, Dominique McElligott as Queen Maeve, Erin Moriarty as Starlight who can make lightning bolts flash from her eyes and Karen Fukuhara! Elisabeth Shue plays the PR of the Superheroes!